For Sale All Locations, South Carolina, Lake City Marion St. 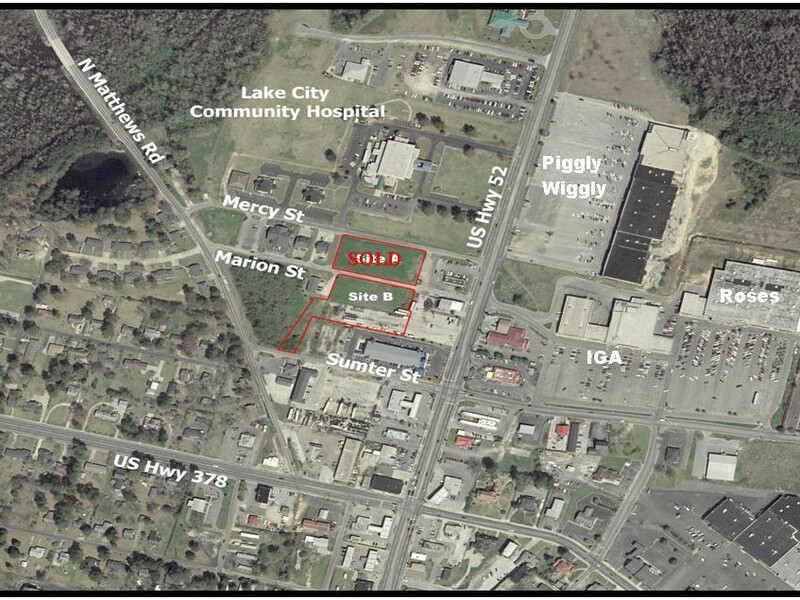 Available is an excellent commercial development tract located in the heart of Lake City, South Carolina. Situated adjacent to the Lake City Community Hospital Campus, the site is a great opportunity to become a part of this medical/professional office sector of town. The immediate neighborhood is home to many medical and professional offices as well as numerous retail and food and beverage establishments. In addition to the hospital, the property is adjacent to a Huddle House restaurant, the Lake City Inn hotel, and the Medicine Shop Pharmacy. The site is situated in the city limits of Lake City and has access from Marion and Sumter Streets. Site is visible from US Highway 52 and is also located one block from US Highway 378. The property is zoned HB, Highway Business and has approximately 285 feet fronting Marion Street and 53 feet fronting Sumter Street. Site has municipal water and sewer, natural gas and electric utilities available.